Attention readers: The Golden Spotlight has a new name – it is now the Seasoned Saint Spotlight. The first Seasoned Saint is Sister Vivian Lewis. 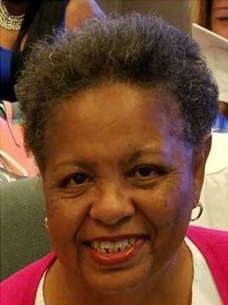 She was born on April 18, 1953 and is the wife of: the late, Rev Walter E. Lewis, Jr. Walter and Vivian are the parents of 3 daughters: Sherrie, Danena and Tiffany and 2 grandchildren: Sidney and Vivian Rose. Her hobbies/interest are gardening, reading, cooking, debating/discussing trends in careers and education along with monetary/political issues. Sister Lewis was a Houston County educator for 29 years. A wife and mother for 42 years; FBBC Marriage Ministry for 7 years; Prayer Ministry; Comforters’ Ministry; Mother-Board Ministry and Family Promise. Quotes from Sister Lewis: “My careers narrowed my focus to the inner individual rather than what meets the eye. Everyone has a purpose and varied means of achieving it. Obtaining their goal(s) is not within their hands nor mine. I am only here to assist. “Her most important lesson learned: “I am powerless like a rose without color or fragrance without God’s power to bring beauty and usefulness.” She would like to be remembered as the little mother or lady who gave joy and a smile to someone at the crossroads of life. To Generations x, y and Z – Slow down and live – “Listening is far more important than speaking” Her special scripture is Psalm 91:1-2. Written by Isaiah Whittaker Sr.